Classic English fried egg-and-bread breakfast is transformed into a quick dish - without the frying! Spread remaining 4 bread slices with margarine. Place, margarine-sides down, in 13x9-inch baking dish; sprinkle with 1/2 cup cheese. Top with cut-out bread slices to make four sandwiches. Break 1 egg into each hole. Sprinkle with remaining 1/4 cup cheese and the bacon. Bake 15 to 20 min. or until cheese is melted and egg is set. 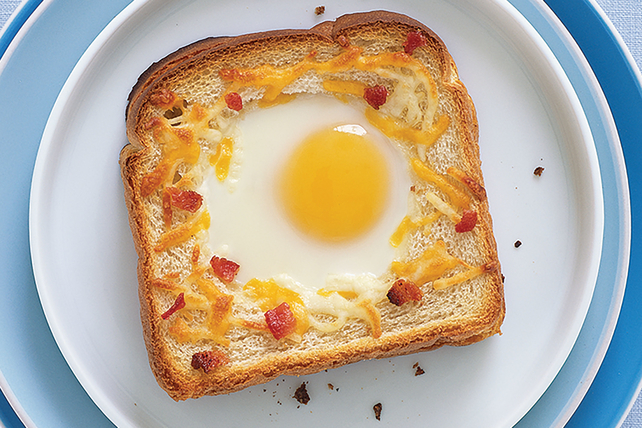 Instead of discarding the cut-out bread circles, serve them with the baked sandwiches to soak up the runny egg yolks. Or toast them and serve topped with your favourite Kraft Pure Jam. Create a different look for each sandwich by using a variety of cookie cutters to make the bread cutouts. Prepare as directed, cutting the ingredients in half and using an 8-inch square baking dish.